DIY Solar Power: The Opportunity You Cannot Afford to Miss! We are all well aware of the fact that solar power is ideal for home and the office. It is cost effective, pollution-free and environment-friendly. And this is why there are so many alternative energy incentives to urge people to go solar. 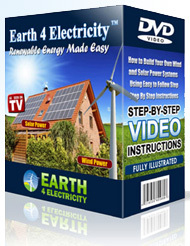 (b) To build a DIY solar panel at home. Considering the pros and cons that concern a fragile power generating device like a solar panel, the second option seems more feasible. So, a brief description of how a do-it-yourself (DIY) solar panel can come to shape is given here. 1) Get hold of a couple of 3 x 6 mono-crystalline photovoltaic or solar cells. This makes (3 x 6) x 2 = 36 cells altogether. Since each cell is capable of generating ½ volt of electric current, 36 cells would generate 18 volts, which would be good enough to charge 12 volt batteries. Mind you, these solar cells are as thin as paper and as brittle as sheet glass. 2) From the outside look, a solar panel resembles a very shallow box. So, start out building a shallow box in such a way that sunrays can hit the solar cells from all possible angles. The box may be made out of masonite peg-boards screwed together against a wooden framework. Most of these items would be available with the local hardware chap. 3) As the solar cells need protection from the weather, use a plexiglass to cover the front part of the structure. 4) Now comes the most difficult part of the job, namely, soldering all the cells together. On the one hand, the cells are so thin and fragile that a slight pressure on them is liable to make them ineffective while on the other, a little bit of force is required to get them soldered to perfection. Low-wattage soldering iron may do the job well if rosin-core solder is used all through. In fact, it is better to use a rosin-pen on the solder points at the back of the cells before attempting to solder the points. 5) When the soldering is over, a small hole has to be drilled at the back of the framework so that the connecting wire may come out of it. 6) And finally, the plexiglass protective cover is glued to the frame. 7) Since each solar panel in a solar power system needs a blocking diode in series to prevent the panel from discharging the batteries at night, a polarized two pin device is attached at the end of the panel wires. Or better still, get yourself a manual that will show you step by step how to install solar panels easily and also where to install it. There are simply too many alternative energy incentives from which you can gain for you to ignore solar power. Then there is the cost saving (by means of reduced electricity bills) and contributing to clean up the environment. The manual should also show you where to get cheap parts from and also how to wire the system. You finally will also need to know the safety precautions and then you are all set to go solar.